Sarvesh stood first. Sarvesh stood first. Sarvesh is happy. He is happy. Neelam is here. Neelam is here. Neelam is busy. She is busy. This is a pen. This a pen. The pen is red. It is red. Judy and Wendy are sisters. Judy and Wendy are sisters. All like Anuradha. All like her. Salim is playing cards. Salim is playing cards. Tell Salim to work. Tell him to work. Where are the boys? Where are the boys? Call the boys here. Call them here. The words he, she, it, they, her, him, and them in the above sentences are Pronoun. Pronouns are words that are used in place of nouns. **Pronouns stand for Nouns. Here ‘I, my, me, we, our, us’ are used for the persons speaking. These are called Pronouns of the first Person. 2. You help your sister. Here ‘you, your’ are used for persons spoken to. These are called ‘Pronouns’ of the Second Person. 5. Mohan and Sohan are brothers. 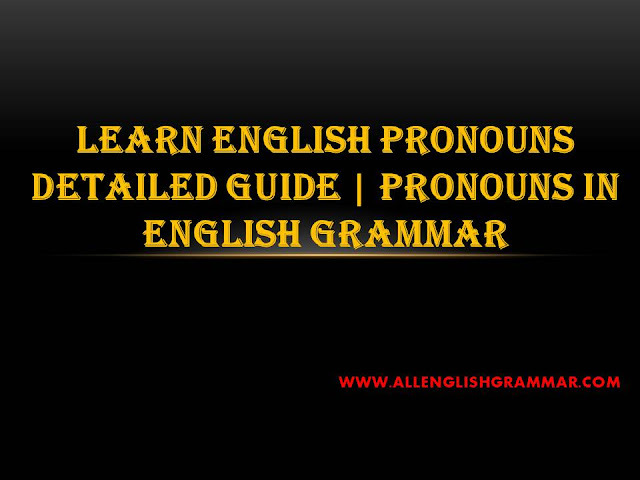 Here ‘he his, him, she, she, they, their, them’ are called Pronouns of the Third Person. 1. Here is Kapil. He is a cricketer. 2. This is Anuradha. She has sweet voice. 3. Give me a pen, please. I need it. 4. They are our friends, they gave us sweets. 5. Her come Hamid and Rashid. They are friends. 6. The dog saw the man. It barked at him. 7. The woman was wearing a ring. She lost it in the fair. 8. Listen to the teacher. He is taching. 9. Listen to the singer. She is singing. 10. Mangoes are ripe. Buy these. 11. Birds build nests. They lay eggs in those. 12. Monoj is here. His motherl loves him dearly. 13. You help your friends. They help you. 14. Where are the girls? Call them here. 15. The girl was singing. She was happy. Her friends liked her songs. 1. I do not worked daily. 2. I have no mothor-bike. 3. I have a book in my hand. 4. My father and mother love me. 5. Please give me a pen. 6. Radha is my sister. 7. We love our parents. 8. Our friends do not speak loudly. 10. I am a boy. My name is Chetan. 11. Our teachers are kind to us. 12. My brother is innocent. 13. Scotch is my dog. 14. The cow gives us milk. 15. We love our motherland. 1. You love your books. 2. Rajesh met you in the park. 3. You are glad at your success. 4. You always come late. 5. The dog will bite you. 6. You were not at home yesterday. 7. These are your books. 8. I will not go with you. 9. The teacher didn’t see you. 10. You beat your brother. 11. Your brother weeps bitterly. 14. Your knife is blunt. 1. ----------------------- am a boy. 2. ----------------------- name is Raju. 3. ----------------------- is a girl. 4. ----------------------- name is Rehana. 5. ----------------------- are my sisters. 6. This ----------------------- my pen.